Buddy is an absolute pro at feeding himself with his hands and we are fortunate that he is not a fussy eater. His spoon control is however somewhat lacking. To help him to improve on this we have been doing lots of activities that require him to scoop and dump. 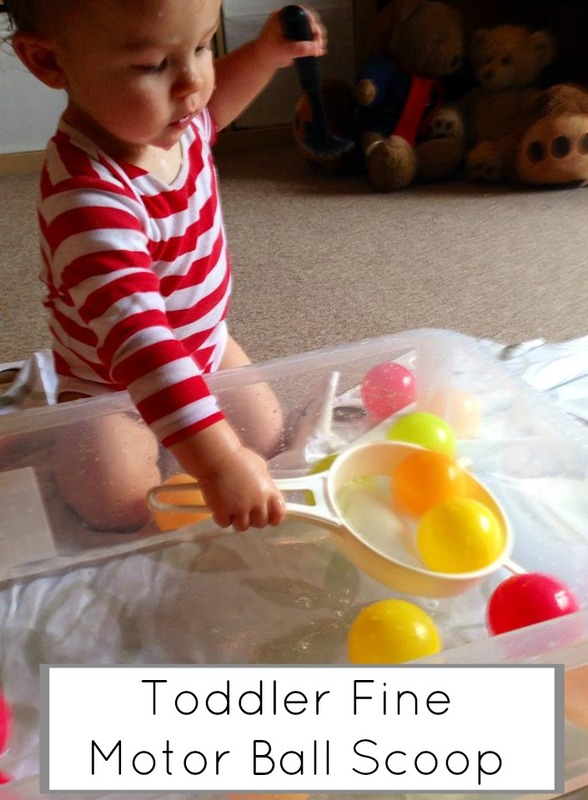 This will (hopefully) help him to master those tricky fine motor movements he needs to scoop up food, hold the spoon steady and direct it towards his mouth! 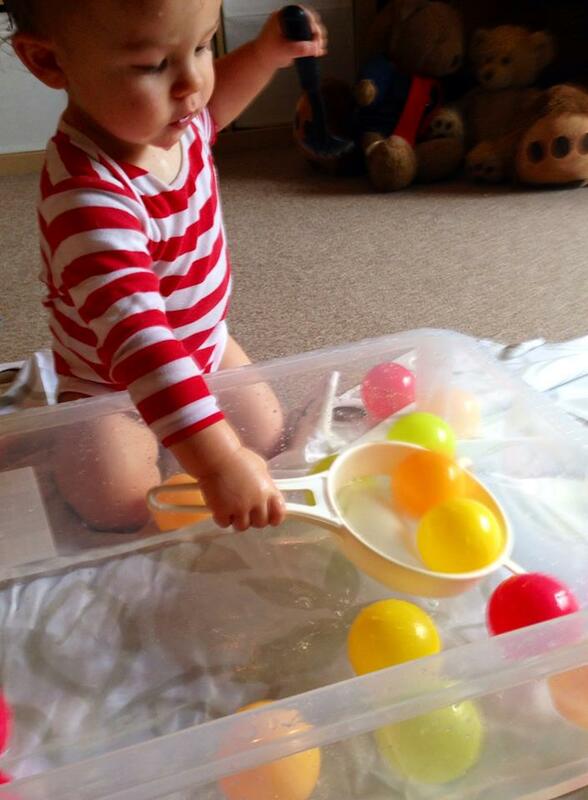 One of our favourite scooping activities so far has been his Water Ball Scoop. I half filled Buddy’s sensory bin with warm water and threw in about 15 plastic balls. Ours are all in Autumnal colours at the moment following our Discovering Autumn Colours play. I then picked out a slotted spoon and a sieve to act as the scoops. We played with this indoors and set up play on a shower curtain. Buddy loves water play however he looked slightly bemused when I set this up in the living room – water play is usually a strictly outdoor or bathroom activity. He soon got over his confusion and dived straight in. 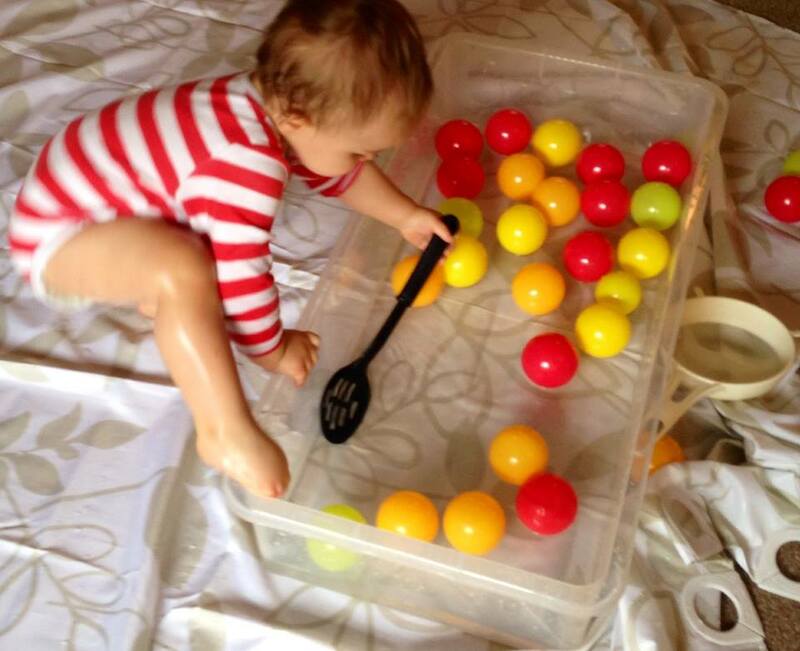 He enjoyed splashing the water and catching the slotted spoon. He spent a while smacking the spoon into the water and he giggled like mad at the splashes he made. We were both wet through within minutes. He then made a beeline for the sieve. He tried to use it as a hat and a mask at first – in our house anything can be a hat or a mask! Apparently it tasted good! Buddy then had a go at swooshing the sieve through the water. He caught a ball by pure accident. Some rapturous applause from mummy led to him focussing his attention towards capturing balls in his net. He was really quite good at it! He then turned his attention back to the slotted spoon and tried to catch a ball with that. This spoon proved a lot more challenging and Buddy grew quite frustrated (as he does at meal times when trying to feed himself.) He persevered for a while but then decided that the water was much more fun than the balls. Good job I had a few towels on hand! 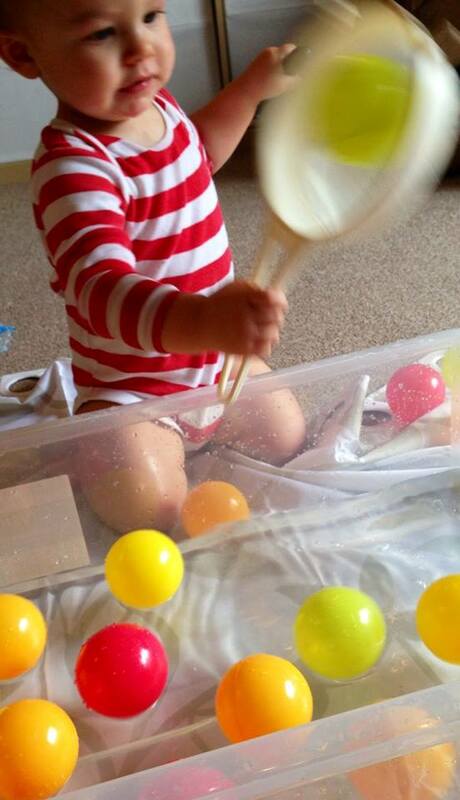 Buddy was working hard at his gross motor skills – standing, sitting, squatting, reaching, pulling and splashing. 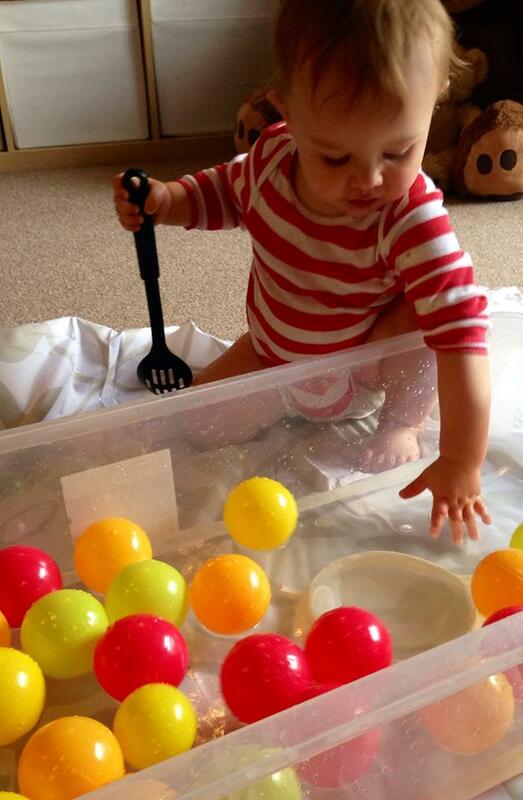 He was also practicing his fine motor skills – holding the spoon, scooping and holding the spoon and sieve flat. This was a really fun way to play and it was also one of the cheapest and easiest plays we have set up. We are going to expand on it by using rubber ducks next time – our home made hook a duck! I hope you enjoyed this play and as always I welcome any comments and feedback. He looks like he was having fun and learning a lot too.